Did Russian early-warning system see the meteorite? The meteorite that exploded over Chelyabinsk on February 15, 2013, was a pretty big thing - NASA estimated that it was about 15-17 meters in size and weighed 7-10 thousand tonnes. Surely it should have been detected by someone. Quite a few commentators in Russia indeed asked why the country needs all these early-warning radars if they could not detect something that large and threatening - it's worth keeping in mind that the explosion that accompanied disintegration of the meteorite was equivalent to about 500 kt. As far as I can tell, the early-warning radars never had a chance, but it wasn't their fault - the problem was that they were never supposed to detect objects that are coming from outer space. The picture above shows the estimated trajectory of the meteorite and fans of the Daryal radar in Pechora and Dnepr in Mishelevka. The fan of the Don-2N radar of the Moscow missile defense system can be seen as well (for other radars, see this post). It's better to see this in Goolge Earth - here is the kmz file. I assumed for simplicity that the meteorite flew along a straight line - that's not quite correct, but should work for the purposes of this analysis. 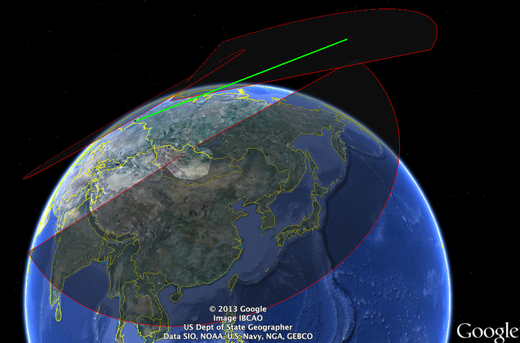 The AGI simulation of the trajectory based on the Meteosat-9 data shows that the meteorite came from the azimuth of about 60 degrees (they got the meteorite path wrong, in fact - it passed to the south of Chelyabinsk, not to the north). A different estimate suggests that the azimuth could be about 100 degrees, but that doesn't matter much in the end. The re-entry angle is taken to be about 15 degrees - this is what various photos show. As can be seen from the picture, the meteorite was out of the field of view of the Pechora radar and it was below the horizon as seen from Moscow, so the Don-2N radar could not see it either. The Dnepr radar in Mishelevka might have detected the meteorite if it looked up, but it didn't - as an early-warning radar its mission is to search the narrow strip of space just above the horizon, which a ballistic missile would cross if it ever comes. They don't (and shouldn't) much care about anything else. These radars are not supposed to search the entire sky on a continuous basis - it would be a waste of energy and would decrease the effective detection range. An early-warning radar could see objects at higher elevations (up to 34.5 degrees in the case of Dnepr) and does so if it is asked to track a satellite. But you have to ask and since nobody saw the meteorite coming nobody did. 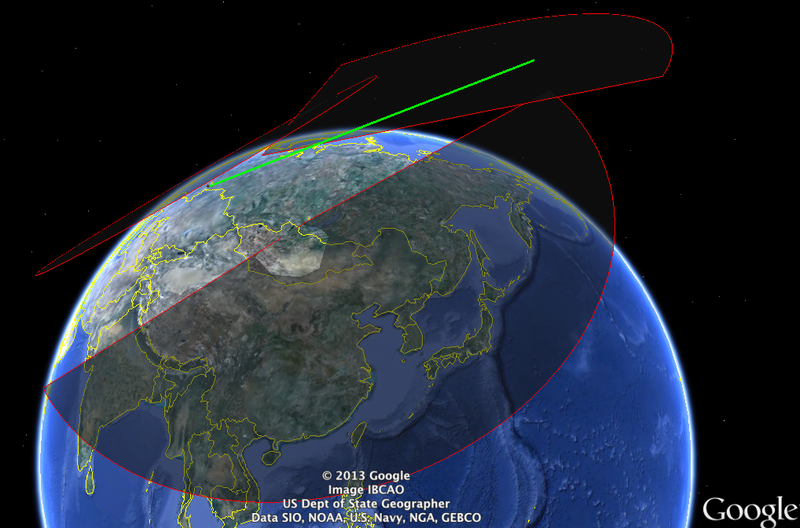 The Google Earth file also includes a fan of the Krasnoyarsk radar, which was supposed to close the proverbial "Eastern gap" in the Soviet early-warning radar coverage. As one can see, that radar would not have been able to see the meteorite either. The bottom line is that there is nothing wrong with the Russian early-warning system. The reason the meteorite was not detected by the Russian early-warning radars is very simple - it was not a ballistic missile. It still leaves an interesting question - what happens if you see a 500-kt explosion on (or above) your soil and have no idea what it is and where it came from. I guess we know now what the Russians do - they would rush to upload their dashboard camera videos to YouTube. Did any early warning system of any nation detect this object? Were the Russian commentators in question suggesting that something could be done if the asteroid had been detected? Given its speed and the low detection range, that seems pretty fanciful. That last question is indeed an interesting one. Still, it's pretty reassuring that it's been answered for us in a way that doesn't involve Armageddon. And if a high-alert country like Russia doesn't spasm and launch, then that's definitely good sign for the other nuclear powers. >>Were the Russian commentators in question suggesting that something could be done if the asteroid had been detected? Only the bureaucrats with nothing better to do, politicians trying to justify their existence and yellow journalists pretending to be "military analysts". Pavel -- you had corrected it earlier but it seems back to original(?? ): 10^3 factor in mass needs to go back in. It does beg the question however, did any Russian radar facility see this coming? Forget for the moment air defense radar systems. Did Russia have the technical capacity from space based assets or from the ground to see the asteroid coming? China? Did the Europeans? Did NASA or the US military? All fair questions. yousaf: Thank you. I corrected it again. As it turns out, the European weather satellites Meteosat-9 and 10 saw the trail of the meteorite once it entered the atmosphere. Not that this would be of any use for early warning. Here are a couple of news articles showing the captured images, which can also be seen on the Eumetsat website. and OKNO at 38.280552° 69.225043° ? Frank the NAS did a study on this in 2010 -- google "defending planet earth"
Thanks for great analysis! But what about USA missile defence? The radar station in Alaska could see the meteor from behind then it passed over Sibiria.